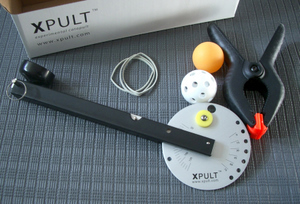 The XPULT catapult was developed by Professors Terwiesch and Ulrich at the University of Pennsylvania for use in science projects, science education, and for teaching spc, design of experiments, and process improvement. The Xpult is an experimental catapult that can complement or substitute for expensive catapults such as the statapult. The xpult catapult was designed for teaching six sigma, process capability, design of experiments, experimental design, and statistical process control. The XPULT catapult is a popular school science project and is used in science fairs for school children. Kids love the xpult catapult as much as university students, faculty, and corporate trainers. Unique science projects for 5th - 12th grades. Perfect for experimental design and analysis. In-class exercise for science and math teachers. Learning scientific method, data collection, cause-and-effect relationships. Proven highly engaging for students ages 8 - 18. Used widely in engineering and business programs. Teach key concepts of variability, process control, design of experiments, SPC, six sigma. Small, light, inexpensive hardware can be distributed to participants for advance preparation. Available .ppt slides, spreadsheets, teaching notes.